In addition to formatting the cRIO, the Imaging Tool can also be used to configure the programming language and a few other settings on the cRIO. The programming language the cRIO is set for can be changed using the cRIO Imaging Tool without reformatting the cRIO. To do this, make sure the Format box is unchecked, select the bubble for the desired language, then click Apply. NetConsole is a small application on the cRIO which allows you to view the console output over the network. 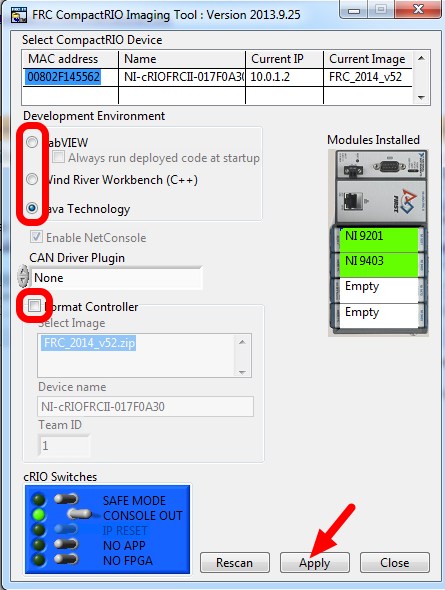 NetConsole can be enabled or disabled on the cRIO by making sure the Format box is unchecked, checking or un-checking the Enable NetConsole box, then clicking Apply. Note that NetConsole is required for Java and cannot be disabled. The CAN plugin currently in use on the cRIO can also be changed without formatting. Choose the appropriate option for your CAN bridge (Black Jaguar, 2CAN or None), make sure the Format box is unchecked, then click Apply.